Since the September highs, shareholders of the FAANG stocks have lost, collectively, over $1T of equity, but this might only be the beginning. As you know, I am personally incredibly bullish in the near-term and have been buying aggressively, over the past several months, companies, such as: Walgreens ($63.90 cost-basis / $80.81 today), Starbucks ($56.32 cost-basis / $65.70 today), Applied Materials ($32.26 cost-basis / $35.05 today), Kimberly Clark ($104.11 cost-basis / $112.82 today), and Cardinal Health ($50.87 cost-basis / $52.88 today), but I don’t expect the next decade to be one for the record books for Corporate America, whatsoever. I’ll keep accumulating shares of the best businesses on the planet, when they trade at a steep discount, as all the above ones had, at one point. I’ll even keep buying the S&P 500 low-fee index, as I do every time it dips by 4% or more, but I am going to make three paramount changes, once this bull market ends, in order to keep outperforming during the bear years. During a bull market, concentration Iin the portfolio works (owning few stocks), even for amateurs. Investors can pick stocks, almost at random, out of the S&P 500 and generate a positive return. The economy is booming, central banks support with liquidity, by keeping interest rates low, taxes are cut for corporations, and every dart hits the bullseye, but this isn’t how the next cycle will feel. Yes, there are businesses, which will flourish. Heck, there are entire sectors, whole industries, that will do well, but you’d have to do serious work to find them. The other problem about it is that the S&P 500 is projected to return around 5%, so even if you are going to beat it, the yields will likely be in the high single-digits, at best. We are moving into a low-returns investment world, for a lengthy number of years. The various stimulations have already been seeded, sowed and reaped. Lower interest rates have “manufactured” higher multiples; QE programs have kept bond yields low, creating a necessity to invest in the markets and an incentive for CEOs to announce huge share buyback programs, and, lastly, tax-cuts have automatically made corporations more valuable, but what juice is left to lift prices higher still? See, what one of the most deceiving attributes of bear markets is that there are more up-days than down-days in a bear market, so don’t get confused because all it takes is for the sellers to overwhelm the buyers, and that’s not hard to see happening, judging by global woes. From the January 2018 highs, here’s how various asset classes have behaved: US dollar 8.6%, cash (in general) 1.45%, Corporate bonds -4.3%, Government-issued bonds -4.4%, commodities -7.34%, and stocks (globally) -11.7%. Making big returns requires a skill, which is referred to by Warren Buffett as Independent Thinking. Right now, no one wants to hold cash, since QE programs and low-interest rates have incentivized people to do the opposite, so we have a global savings problem. I mean, it’s terrible, but most people simply have ZERO savings. 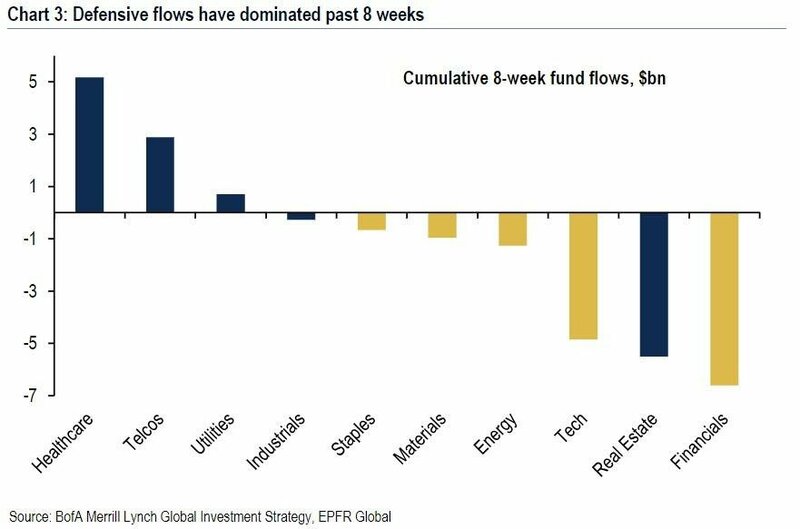 As you can see, investors are switching over to the defensive sectors, but this will not be enough, going forward. Investors are still trying to time the markets, time rallies, forecast the upcoming trends, but they fail to look at the bigger picture. Populist uprisings will begin to create inflationary pressures, as governments will be forced to initiate work-programs for the masses. Therefore, with higher interest rates and higher inflation numbers, look back at the 1970s, for reference. Delivering ALPHA, or beating the markets, will consist of (1) properly balancing between various asset classes, (2) investing in the private businesses, instead of the public ones, so to distribute owner profits, (3) creating a secondary income stream, (4) shorting doomed industries (print, newspapers, brick-and-mortar retail, etc. ), (5) using options to write covered calls and to sell puts and, lastly, (6) investing in inversely-correlated sectors, such as commodities, which boom in such financial environments when geopolitical tensions are elevated. Of course, diversifying into real estate, where it’s cheap, is also critical, especially if you’re in the wholesaling business, which is quite recession-proof. This was one of my tickets to wealth, back in the 2009-2015 timespan. Money is ALWAYS made. New millionaires join the club every day, no matter what’s happening out there, but in bad times, it takes much more to achieve superior results. There’s nothing to do, but to push through and triumph. Investors will get smacked around, retirees will witness how promises are being broken by elected officials, and bondholders will see debtors defaulting. Overall, many more people will experience rough times. The solution will always be to adapt to the world, not fight with it, so have the elasticity to change fast, without stressing-out. TERRIFYING: This Makes Me CRINGE!